Player 1 starts with a dribble entry towards 3. 3 and 5 cut away. 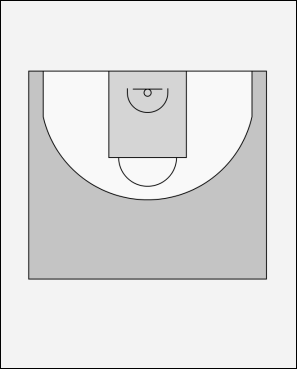 2 uses 4 to cut to the opposite baseline corner. 3 uses the screens of 5 and 4 to get free on top. 4 sets a down screen for 5 who goes to the top. After the screen 4 steps outside the 3-point area. Finally we arrived at the pick and roll, between 5 and 3. After using the pick 3 has 2 passing options towards 4 and the rolling 5.